This past week I received the anniversary set of Douglas Adams Hitchhiker's Guide to the Galaxy series (thanks to my friends at H.B. Fenn). 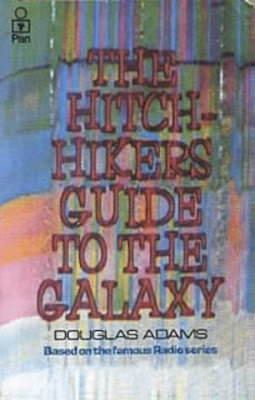 It was hard to believe that it has been 30 years since the release of the original The Hitchhiker’s Guide to the Galaxy. Here's the cover from the original UK edition (1979). 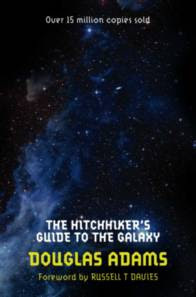 On 12 October 1979 the most remarkable book ever to come out of the great publishing corporations of Ursa Minor (and Earth) was made available to humanity – The Hitchhiker’s Guide to the Galaxy. 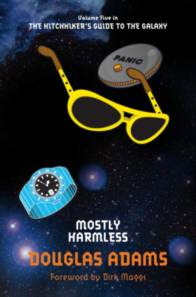 Pan Macmillan is celebrating thirty years of planet-hopping comic genius with the publication of special editions of Douglas Adams' iconic books. With new forewords from Russell T Davies, Terry Jones, Simon Brett, Neil Gaiman and Dirk Maggs, these editions are a must-have for Hitchhiker readers. Turn to the back of each book to find exclusive material from the Pan Macmillan archives, such as original synopses, press releases, photographs and letters from Douglas to his publisher. 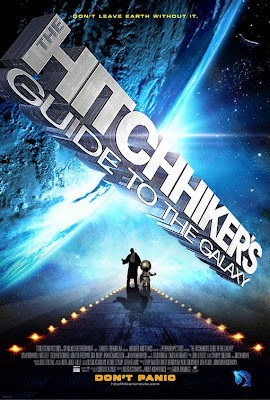 Whether you’re a seasoned Hitchhiker fan or experiencing Arthur Dent’s intergalactic adventures for the first time you’ll love the fun new design, including The Hitchhiker’s Guide to the Galaxy’s “DON’T PANIC” DIY sticker cover. As you can see from the cover below you can decorate it with the included sticker collection. 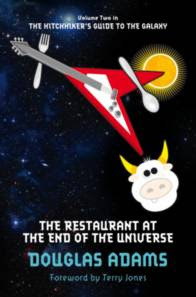 If you've done six impossible things this morning, why not round it off with breakfast at Milliways, the Restaurant at the End of the Universe? After a number of stunning catastrophes, Arthur Dent is surprised to find himself stranded on Prehistoric Earth. Luckily, an eddy in the space-time continuum lands him, Ford Prefect and a sofa in the middle of Lords cricket ground two days before the world is due to end. There is a knack to flying. The knack lies in learning how to throw yourself at the ground and miss. It's not an easy thing to do and Arthur Dent thinks he's the only human who's been able to master this nifty little trick - until he meets Fenchurch, the girl of his dreams. Arthur Dent hasn't had a day as bad as this since the Earth was blown up. Depressed and alone, Arthur finally settles on the small planet Lamuella and becomes a sandwich maker. Looking forward to a quiet life, his plans are thrown awry by the unexpected arrival of his daughter. I loved HHGTTG with its wacky absurd humour that was reminiscent of Monty Python. 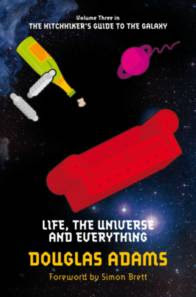 The first book is actually derived from the BBC radio show of the same name written by Douglas Adams. Later the BBC did a six-part television series based on the book. 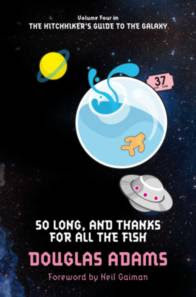 Here is an excerpt from one of those episodes that features the Babelfish. Any of you familiar with Yahoo's Babel Fish online translation service should find the clip of special interest. Sadly, Douglas Adams passed away in May 2001. The series of course was eventually made into a motion picture. Here is the movie poster and trailer for the film. If you haven't yet read a Douglas Adams book, start at the beginning and enjoy the ride. This year also saw the release of And Another Thing... a sixth book in the series written by Eoin Colfer, author of the YA series Artemis Fowl. Read an interesting interview with Eoin at The Guardian about the book and his reflections on HHGTTG. There is also some terrific information on the series at the promotional website for the book. I loved these when I read them all those years ago. I don't believe I've read the last two, but it's nice to see the story revived. I enjoyed the hilarity and the preposterousness of the situations. About ten years ago a friend gave me the complete set as a gift, and I gave up after the first chapter or two. I just couldn't get into it, but maybe I'll try it again. Having children has taught me a lot about laughing through pain. Omg you are insanely lucky to get this set. I go into crazy fan girl mode just thinking about The Hitchhikers Guide. 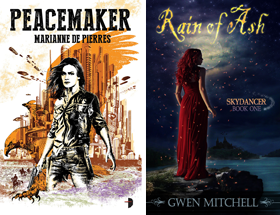 The frood in us all can rejoice at the release of these books. So awesome. Hey Dottie apparently the newest book by Colfer is getting positive reviews saying that he has pretty much captured the feel of the original books. Nice to see. Me I was a fan of the BBC TV series. Rebecca actually I understand that. Sometimes the nature of the humour seems a little offbeat especially for UK writers. I have difficulty getting into Terry Pratchett for example which I am sure some would call sacrilege. LOL Jessica Don't Panic has been my mantra for many years. I enjoyed the TV series as well, along with Dr. Who, both the old and the new. I went to see the movie, no one but me got it. lol. Let's just say the movie was different. Dottie I saw the movie too and it struck me as just a little too slick. Sometimes smaller is better.